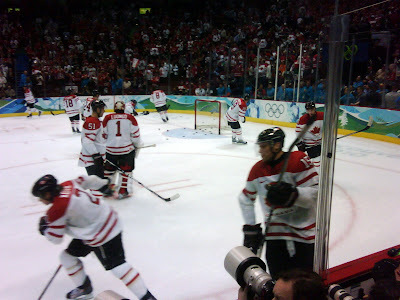 Tabubilgirl: Canada Takes Olympic Hockey Gold! I phoned my sister for our monthly morning ritual. "Pinch and a Punch for the First of the Month!" "Yes, yes, never mind THAT. Canada won!!" She watched the game live from the house of a Canadian friend who has cable. "I'm a wreck! I'm exhausted! I'm sweating all over! It was so tense - so agonizing - it went on into overtime and - Oh My Goodness - I could even see Mum and Dad in the audience - Did you see Mum and Dad? Oh no - you don't have cable, do you? You don't even have a Chanel 9 Tower. How bad is that? Anyway - can you believe the seats they had? I was on the phone with Dad telling him when the camera was sweeping around the arena, and he told Mum when to wave - and I saw Dad talking to me on the phone and then I saw her waving at me!! And the game- oh my goodness - the game. I'm sweating - have I mentioned that I'm sweating? I'm exhausted and it's only nine o'clock in the morning. I just couldn't take the pressure. In the third period I decided to put on nail polish to distract myself. When the Canadians actually won, that turned into a reeeeelllly bad idea." "Let me put it this way. I'm not just covered in sweat - I reek of acetone. So do my clothes. So does the sofa. And I have to go a whole day at the hospital - I wonder if I'll be able to take a shower there?" In more somber news, that was a hell of an earthquake that hit central Chile. Our friends in Santiago are checking in as whole and safe - a few close calls - one friend was in the airport waiting for a family member - but unlike many people there, they dodged the falling debris and are unharmed. May all of you down there be safe.